Last day of shark fishing today and myself and Paulos set off for Florida long before the sun came up. We arrived at Little Talbot Island as the park opened just after 7am. 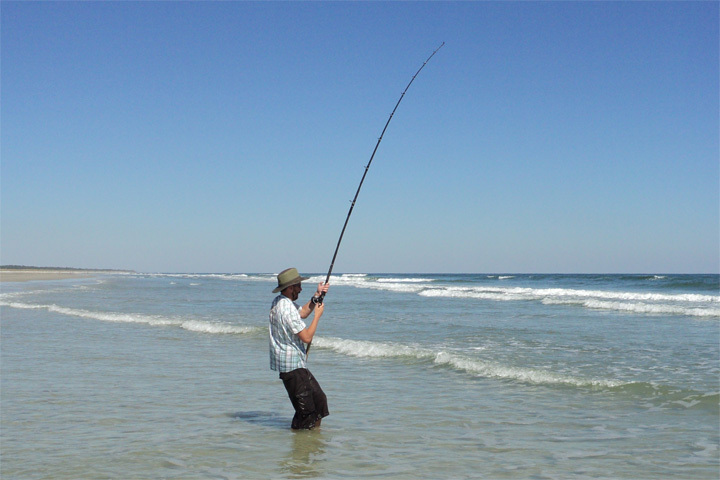 The shark rods were quickly cast out and then we waited... And waited... The action started off slowly. A small bluefish was the first to make an appearance, followed shortly after by a bigger bluefish. 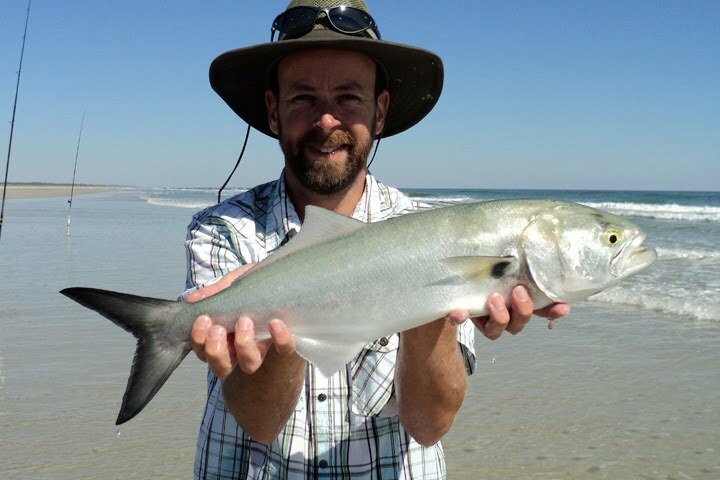 A bluefish, getting on for 4lb. 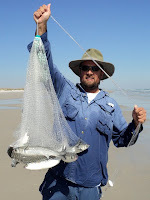 We caught some fingerling mullet with the cast net so I swapped one of the rods over from mullet chunks to a livebait, and soon the rod was knocking round and bits of the livebait were retrieved. Then the rod pulled round hard and I wound down into a good fish, the fish jumped over and over again as it stripped almost all of the line from the multiplier. 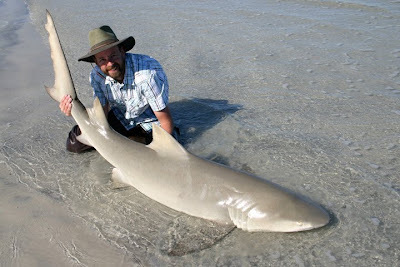 I walked down the beach to regain enough line to play the fish and after a tough fight I landed a 5' 8" blacktip shark. 5' 8" blacktip. Yay, shark number nine. We caught a few more bluefish before the mullet chunk rod started getting some interest, I switched from livebait to a mullet chunk and put a short cast into the surf. The first rod hammered over a fish was hooked but spat the hook, it went back out and I was soon connected to another fish, this one jumped on the leader and broke the line. A quick glance over at the second rod and it was bent double and almost pulling out of the spike. I hit the fish and it was a very different fight, it didn't take a great deal of line and it didn't jump - but it didn't want to come to the beach. After about 15 minutes Paulos saw it in the surf and told me it was a big lemon shark, as it fought we watched it swimming through the clear waves. 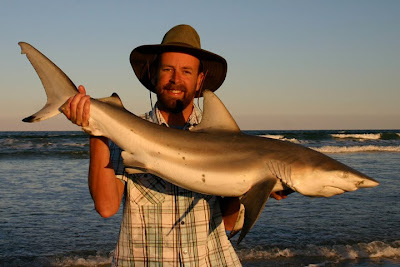 10 minutes later it was in the surf and Paul grabbed it... What a fish... Shark number ten - 6' 11" - one inch off seven foot! 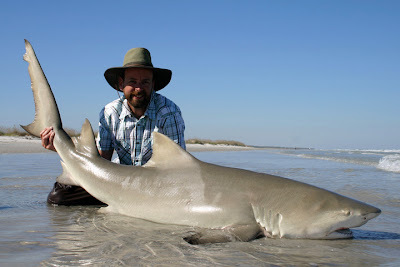 6' 11" lemon shark, about 175lb. We fished on throughout the afternoon, it was mostly quiet, punctuated with brief periods of intense action. 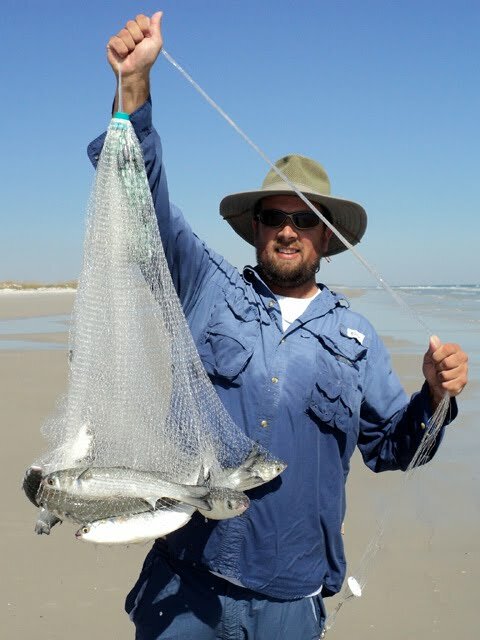 We caught a couple more bluefish and lost about 7 or 8 blacktips, they either jumped and spat the hook, jumped on the leader or in two cases broke the hook. As the sun was setting and the kit was being packed up we had one last run, Paulos signaled for me to hit it and I was connected to the last shark of the trip - another blacktip - 4' 1" - what a fantastic day! 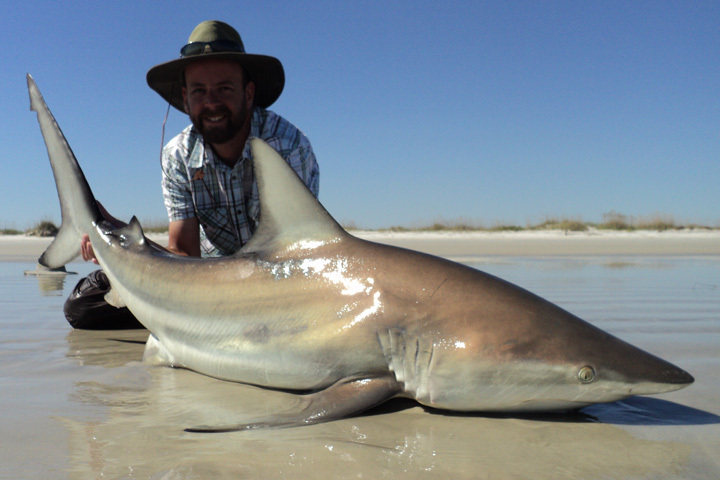 Three sharks today and eleven in total over the 2 weeks, thanks to my ghillie, Paulos.